There are no shortage of congenital syndromes that are acronyms arranged into some sort of vaguely pronounceable word. There will be lots of doodles about these, but we’ll start off with a more uncommon one – PHACE Syndrome. 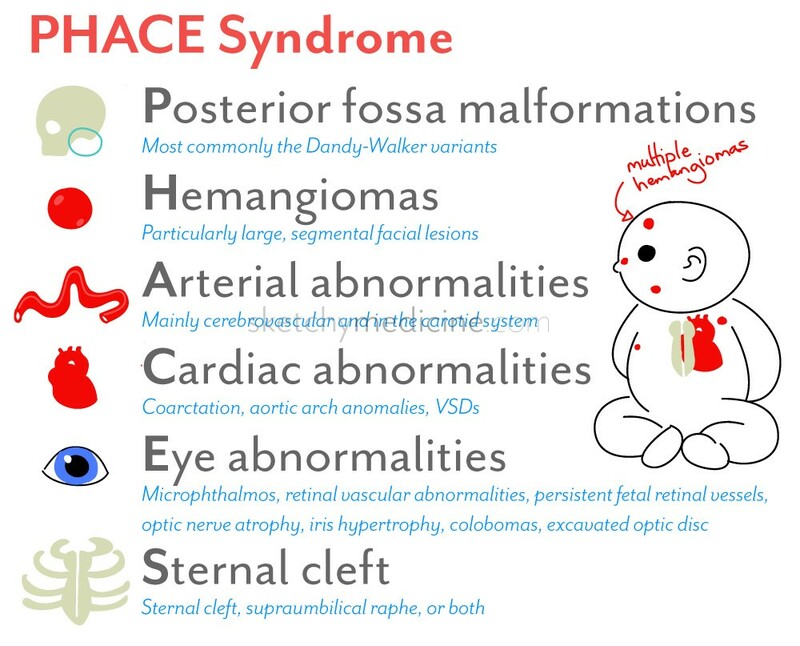 PHACE Syndrome is a collection of findings that go along with large infantile hemangiomas. They’re the more worrisome (but less obviously disfiguring) things you need to look for when you see a baby with a large hemangioma on the face or multiple hemangiomas. 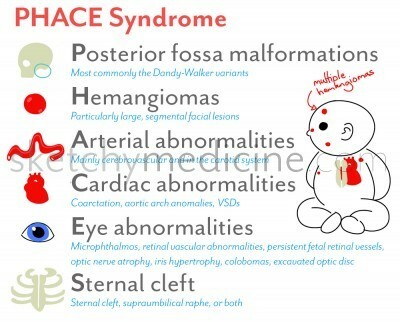 The most common symptom of PHACE is cerebrovascular abnormalities, followed by cardiac anomalies (coarctation, aortic arch anomalies, VSDs). If you suspect PHACE, do clinical exam of the skin and eyes and MRI of the head, neck and chest. 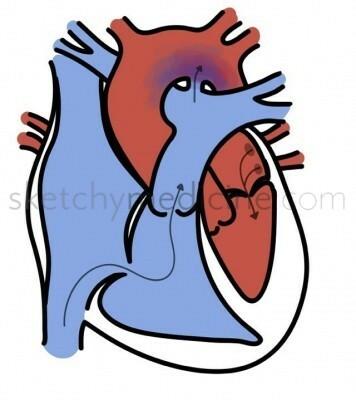 You separate congenital heart defects into acyanotic and cyanotic. Basically, is the baby (or kid) nice and pink, or is he or she dusky as they like to say. Sometimes the blueishness only happens when they’re working really hard, like feeding and crying (or thinking about the pathophysiological mechanisms of heart disease). 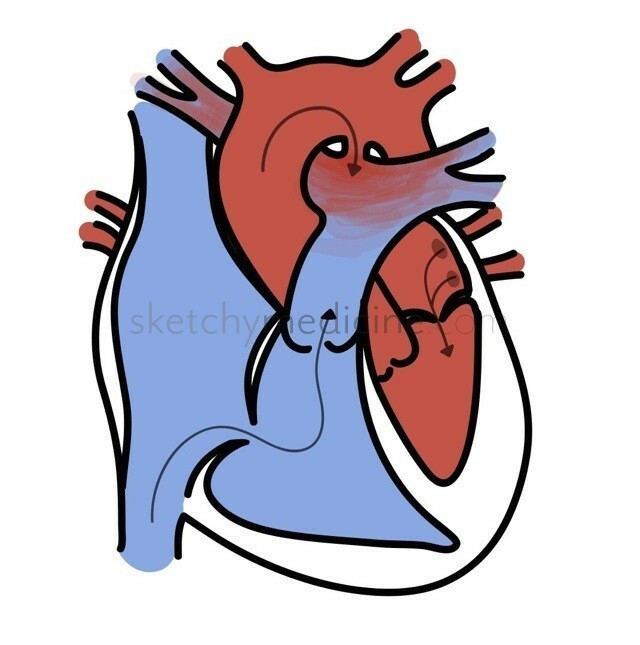 One of the important things to remember is that acyanotic heart defects can switch over if they’re left alone for too long because of pulmonary hypertension caused by the extra flow. This is called Eisenmenger Syndrome. It’s also important to realize that many of the cyanotic lesions are duct dependent, meaning that as long as the ductus arteriosus is open, they are happy and pink. 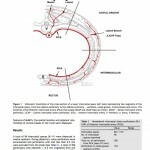 The problems start in that time 6-24h after delivery when the ductus closes. Thankfully you can keep it open by giving prostaglandin E1. 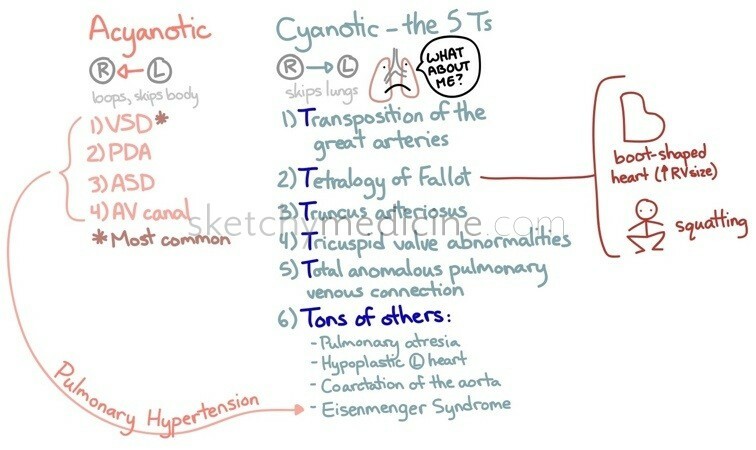 Also, I realize that the 5 Ts of cyanotic heart lesions are a pentad of 6 (plus some), but mnemonics can only do so much, and the T thing is just so catchy. 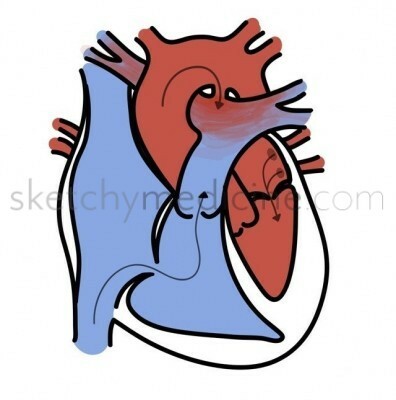 For a more detailed illustration of PDAs, you can check out this doodle!